As an interior designer you have an array of clients: clients that have “important art”, some are just starting a collection, and some need pieces to connect their art and décor. 1st Art Gallery is the most effective tool an interior designer can have in building his clients’ art collection and growing his own business. You can offer your clients original custom made pieces designed by yourself or by our artists, or offer to turn any of their photographs into handmade oil paintings. You can mix our reproduction pieces with your clients “collection pieces” or introduce a client to fine oils within their budget. How can 1st Art Gallery help YOUR Interior Design business? 1st Art Gallery is here to help you grow your business. 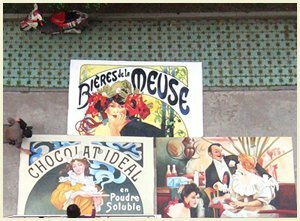 At your disposal are more than 30 highly trained reproduction artists, 14,000 square feet of open space studio and 15 years of experience in the Oil Painting Reproduction business. 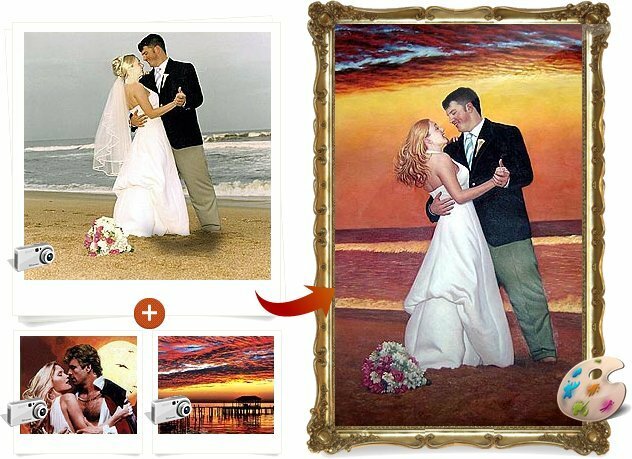 We turn photographs into paintings, combine a number of images into a single painting, or we can create entirely original work. For a complete list of the types of original art we can create please visit our Custom Orders page. It is safe to say that our clients are limited only by their own imagination - we can paint ANYTHING. 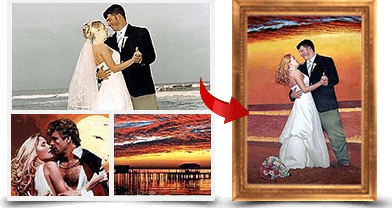 Custom made portraits - a wedding photo, an old poster and a romantic background image combined into a single painting. 2) We can reproduce any famous painting ever created. You can search within our extensive database, which holds more than 300,000 paintings, by the artist’s name, by art movement and style, by subjects (e.g. landscapes, paintings of Venice, etc), collections and even museums.. Since our painters work “from scratch” and on a blank canvas, we can paint any painting in any size. The largest painting we created so far was more than 15 feet wide and 10 feet high. A bird’s eye view on three extremely large paintings custom made for a restaurant. 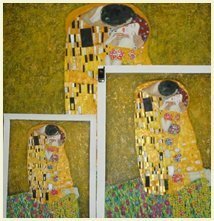 Gustav Klimt’s The Kiss in three different sizes. 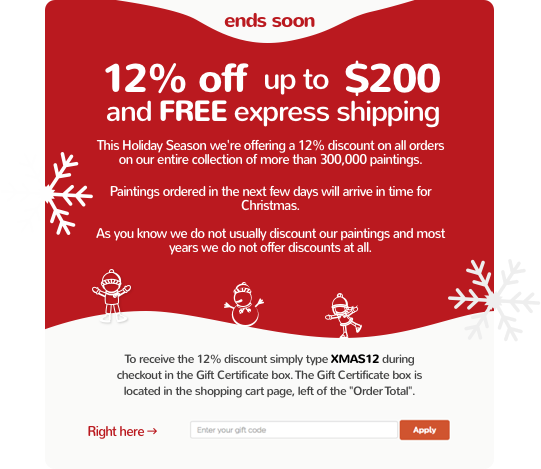 1st Art Gallery is the world’s leading Oil Painting Reproductions company. Our company and paintings were featured in numerous TV segments and magazine articles. You can watch one of them here. Prices that allow anyone to start a collection of handmade oil paintings. As we have our own studios and artists the average completion time of most projects is three weeks. We make sure we never miss our predetermined deadline so you will not miss yours. For urgent projects we can expedite the process and deliver the paintings in less than ten days. More than 15 years of experience selling handmade oil paintings directly to consumers worldwide means we really know our work. Although we offer a full money back guarantee on all orders we almost never receive a painting back. Please visit our testimonials page to see some of our paintings as they proudly hang in our customers’ homes. You can reach us seven days a week, around the clock, by email or phone..
Want a printed catalogue to show your clients? Or a gallery collection on CD-ROM for your clients to browse? Would you like us to make recommendations on art, such as recommend paintings with a medical theme for a hospital project? We will do our best to support our interior design partners and allow them to focus on what they do best.